Fáilte go Coláiste Ghlór na Mara. Is scoil lán-Ghaeilge ilchreidmheach muid atá lonnaithe i bhfoirgneamh álainn ar Bhóthar na hAille, Baile Brigín. Osclaíodh an scoil i Meán Fómhair 2014 le freastal ar dhaltaí i bhFine Gall thuaidh, oirthear na Mí agus Lú theas. Seo an cúigiú bliain ar an bhfód dúinn agus táimid an-bhródúil as an méid atá bainte amach againn le cúig bliana anuas. Tá córas tumoideachas i bhfeidhm againn ina múintear gach ábhar trí mheán na Gaeilge. Soláthraíonn an suíomh scoile seo faisnéis do thuismitheoirí agus comhphobal na scoile faoi nuacht agus imeachtaí scoile. Na bíodh drogall ort teacht i dteagmháil linn má tá tuilleadh eolais uait. Welcome to Coláiste Ghlór na Mara. We are an Irish language multi-denominational secondary school, located in a state of the art building on the Naul road in Balbriggan. The school was opened in 2014 to serve the people of North Fingal, East Meath and South Louth. This is our fifth year to provide education through the medium of Irish and we are very proud of how much we have achieved. We have an immersion based system in place whereby all subjects are taught through the medium of Irish. This school website aims to provide comprehensive information to parents and the school community regarding school news and events. Mar chuid de Lá Feasachta Idirnáisiúnta an Uathachais, bhí cuairteoirí an-speisialta againn i gColáiste Ghlór na Mara inné. Tháinig Carol Lennon, duine dár dtuismitheoirí, araon le hoibreoirí deonacha eile as My Canine Companions chugainn leis na madraí seirbhíse chun labhairt faoi uathachas agus an obair a dhéanann na madraí seirbhíse. D'fhoghlaim muid an-chuid. Mar shampla, conas idirghníomhú le madraí seirbhíse agus na daoine atá leo i spásanna oscailte. D'fhoghlaim muid go bhfuil sé an-thábhachtach iad a choinneáil ar théide agus muid ag siúl. Má ionsaíonn madra ar an sráid madra seirbhíse, mar shampla, seans go ndéanfadh sé sin neirbhíseach iad. Má chailleann siad na scileanna atá foghlamtha acu sa traenáil, seans nach mbeadh siad in ann an obair a dhéanann siad a leanúint ar aghaidh. D'fhoghlaim muid faoi na cineálacha madraí a roghnaítear le bheith ina madraí seirbhíse, conas a ainmnítear iad, conas a roghnaítear teaghlaigh dóibh agus conas go ndéanann siad difríocht do na teaghlaigh a fhaigheann iad. Os rud é go raibh do mhac/iníon ag an óráid, cuir ceist orthu céard a d'fhoghlaim siad aige; beidh siad in ann an t-eolas a roinnt leat! Ba mhaith linn ár mbuíochas mór a ghabháil leis na daoine uaisle a tháinig isteach chugainn inné; Carol, Debbie, Trish agus Karolina agus na cairde beaga áille a tháinig isteach leo ar cheithre cos, Uggs, Indie, Izzie agus Stitch. Osclaíodh Rang Lir i mí Mhéan Fómhair 2018, rang le haghaidh daltaí le huathachas i gColáiste Ghlór na Mara. Tá an t-ábhar seo an-thábhachtach dúinn agus tá áthas an domhain orainn feasacht maidir le huathachas a scaipeadh, fiú amháin ar bhealach beag. As part of World Autism awareness day, we had some very special visitors in Coláiste Ghlór na Mara today. One of our parents, Carol Lennon, and three other volunteers along with their service dogs from My Canine Companion treated pupils and staff to a really informative session on autism and the important role of service dogs. We learned lots today, for example, how to react to service dogs and their handlers in public spaces. We were informed how important it is to keep dogs on leads when out walking, as if a service dog was attacked by another dog, it could make them nervous, undo their training and therefore deem them unfit to continue in their role. We learned plenty more about why certain breeds are chosen, the criteria used to allocate service dogs to families, how they are named, trained and ultimately the difference these dogs make to the families who are lucky enough to avail of their service. Ask your son or daughter if they were at the talk and if they can share any of the information they learned with you. We would like to sincerely thank our volunteers today, Carol, Debbie, Trish and Karolina and their amazing canine companions, Uggs, Indie, Izzie and Stitch for taking time out of their day to visit us and educate us on World Autism awareness day. As Rang Lir, a class for autistic students opened in September here in Coláiste Ghlor na Mara, this subject is very close to our hearts and we are delighted to be involved, even in a small way in spreading autism awareness. Molaimíd daoibh é seo a dhéanamh chomh luath agus is féidir libh. Bhí ró-éileamh ar na háiteanna anuraidh. Ba mhaith le Coiste na dTuismitheoirí a chur in úil daoibh go léir go mbeidh "Tae um thráthnóna/Afternoon Tea" ar fáil sa scoil ar an Aoine an 29ú lá Márta, 12:00 i.n. le Lá na Máithreacha a cheilúradh. Beidh soláistí ar fáil agus beidh crannchur ar siúl fresin ar an lá. Beidh tuilleadh eolais ag teacht faoin ócáid speisialta seo tar éis an briseadh ach go dtí sin coinnigh an dáta agus tá súil againn slua maith a fheiceáil ar an lá. Coiste na dTuismitheoirí would like to let everyone know that we are planning an Afternoon Tea event here in the school on Friday the 29th March, 12pm to celebrate Mothers' Day. More information will follow but in the meantime please keep the date free and we hope to see as many of you as possible on the day. Is mian linn bliain nua faoi shéan agus faoi mhaise a ghuí ar phobal uile na scoile. Tá súil againn go mbeidh gach rath ar chách i 2019. We would like to wish our whole school community a very happy new year and every best wish for 2019. Ba mhaith linn a chur i gcuimhne do phobal na scoile go mbeidh Coláiste Ghlór na Mara dúnta amárach (Dé Máirt, 04/12/2018) de bharr lá traenála do mhúinteoirí. Go raibh maith agaibh. We would like to remind parents, guardians and students that Coláiste Ghlór na Mara will be closed tomorrow due to a training day for staff members. Go raibh maith agaibh. A chairde, glacfar le foirmeacha clárúcháin don scoilbhliain 2019/20 go dtí an 26ú Deireadh Fómhair, 2018. Tá na foirmeacha ar fáil ar an suíomh seo faoin dtab 'Polasaí Scoile'. A chairde, tá an fhadhb leictreachais réitithe ag an ESB agus beidh gnáthlá scoile amárach againn. Feicfidh muid ar maidin sibh ag 8.20! The ESB have rectified the power outage in Balbriggan and school will open at the usual time of 8.20 tomorrow. See you all then! Beidh torthaí an Teastais Shóisearaigh 2018 á bhfoilsiú ar an gCéadaoin, 12ú Meán Fómhair. Beidh siad ar fáil do na daltaí ar an lá ar a 2.30in in Aitriam na scoile. Tá míle fáilte roimh ár dtuismitheoirí/caomhnóirí freisin ar a 2.30in. Beidh tae agus caifé ar fáil. Junior Certificate results, 2018, will be published on Wednesday, 12th September. They will be distributed to our students at 2.30pm on Wednesday in the Atrium. Parents/Guardians are most welcome to join us. Tea and coffee will be provided. Cliceáil ar an nasc thíos mar eolas maidir leis an oíche oscailte, 2018. Tá muid ag súil go mór le sibh a fheiceáil anseo i gColáiste Ghlór na Mara; tá fáilte roimh chách! Click on the link below for information on our open night, 2018. We're really looking forward to welcoming you all to Coláiste Ghlór na Mara! Comhghairdeas leis an Coiste Gaelbhratach a bhailigh an dara bratach i mbliana don scoil. Bhí lá mór ann i ráschúrsa an liopaird le Gael Linn, Seo Linn agus Conradh na Gaeilge. Bhain na scoláirí an-taitneamh as agus chan ceann dár scoláirí os comhair an slua, ghlac triúr eile i gcluichí spóirt, giolcaireacht agus in amhrán na gcupán ar an lá. Maith sibh! Congratulatíons to the Gaelbhratach Committee who collected their second Gaelbhratach flag this year for the school. There was a great day to be had at the leopardstown racecourse with Gael linn, Seo Linn and Conradh na Gaeilge. The students enjoyed themselves and even sang in front of the crowd, took part in tweeting competitions and a sports trial. Well done to everyone involved. Bhí Lá Gairmthreora sa scoil ar an Aoine 11ú ina raibh Lucht na hIdirbhliana ag déanamh taispeántas den Gairm agus an Cúrsa ar mhaith leo a dhéanamh amach anseo. Bhí bl3, bl2 agus bl1 i láthair agus bhain gach duine ann sult as. Rinne na daltaí súirbhé ansin ar an imeacht agus bhí siad an-tógtha leis. There was a Careers' day on Friday the 11th in school. The fourth years presented their chosen career paths and there was information on the new point system, the minimum wage per hour. There was a survey afterwards and the feedback was positive. Seo na pictiúir ó chéad cheoldráma na scoile, ‘Mamma Mia’. Dhíol muid amach ceithre sheó thar dhá lá agus oíche agus bhí bród an domhain orainn ár gcéad ghrúpa sa scoil a fheiceáil ar an stáitse. Rinne siad sár-jab agus chaith an lucht féachana na seónna ar fad sna trithí ag gáire. Léiríonn seo an scil atá ag na daltaí san aisteoireacht agus sa cheol ach freisin, léiríonn sé seo an mhuinín atá acu iontu féin, rud atá fíorthábhachtach i saol an lae inniu. Ní bheadh an caighdeán mar an gcéanna ar chor ar bith gan an tacaíocht a thug cór na scoile dóibh ach an oiread. Bhí siad ar fheabhas. Ba mhaith linn ár mbuíochas a ghabháil leis na daltaí agus múinteoirí go léir a chabhraigh leis an seó ach ba mhaith linn freisin ár mbuíochas a ghabháil leis an bpobal. Fuair muid tacaíocht ó chomhlachtaí áitiúla chun an seó a chur ar an stáitse agus tugadh urraíocht dúinn freisin chun duaiseanna a bhronnadh don chrannchur. Ní fiú seó a chur ar siúl mura bhfuil daoine ann chun é a fheiceáil, agus mar sin, go raibh míle maith agaibh as ucht bhur dtacaíochta nuair a tháinig sibh chun ‘Mamma Mia’ a fheiceáil. Tá muid ag súil go mór leis an gcéad sheó eile an bhliain seo chugainn, nuair a bheidh na scrúduithe go léir i ndiaidh na ndaltaí i mbliain 3 😄. Bainigí sult as na pictiúir. Here are the pictures from our first musical, ‘Mamma Mia’. We sold out four shows over two days and nights and we couldn’t have been prouder of our very first cohort of students who put the show on the stage. They did an exceptional job and the audiences spent the four shows in stitches. We were delighted to see our Transition Years develop skills in acting and singing, but also to see them develop their self-confidence, something that will really stand to them in the future. The standard of the show was undoubtedly raised by our First Year choir, they were fantastic. We would like to thank the other students and the many staff members who helped us to put this musical together. We would also like to thank the community especially. We received support from many local businesses who sponsored our program and we also received many donations in the form of prizes for our raffle. A show can only be put on stage if people come to see it, so thank you so much to those who came to support our very first effort. We’re looking forward to the next musical, once our 3rd years have their exams behind them 😁. Buíochas speisialta le Mark Newport, a ghlac na pictiúir. Is cúis bróid é don scoil gur bhuaigh an Coiste Gaelbhrataí an Gaelbhratach arís i mbliana. Míle buíochas as ucht gach duine a thug cúnamh agus cabhair don scoil agus don choiste le himeachtaí agus an Ghaeilge a chuir chun cinn sa scoil agus sa phobail. Beidh bronnadh na nduaiseanna ann ar an 22ú Bealtaine i mbaile na lobhar. The school is proud to announce that we have won our second Irish Language Flag 'The Gaelbhratach' again this year! 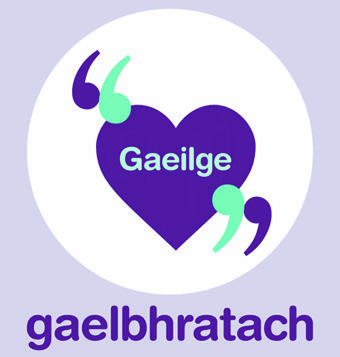 The Gaelbhratach Committee would like to thank everyone for their support and help with promoting the Irish Language in school this year. We hope to see you next year when we lift up our flag . Tá daltaí na hidirbhliana istigh sa scoil inniu ag ullmhú dá gceoldráma, ‘Mamma Mia’. Seo an chéad uair a bheidh ceoldráma ag an scoil agus tá muid ag súil go mór le sibh a fháiltiú chun an seó a fheiceáil. Tá an stáitse nua ardaithe, tá na cultacha istigh agus tá glór na ndaltaí thar cionn. Geallann muid taispeántas dochreidte! Our Transition Years are in today practicing for their musical, ‘Mamma Mia’. This will be our first ever musical and we’re really looking forward to welcoming our school community to see the show. The new stage has been built, the costumes are ready and the students’ voices are on point! We promise an unforgettable performance. Is féidir na ticéid a cheannach ón scoil. Beidh siad á ndíol in oifig na scoile agus ó sarah@cgnm.ie. Caithfear íoc as na ticéid roimh an seó! Tickets can be bought from the school. They’ll be for sale in the school office and also by emailing sarah@cgnm.ie. Tickets must be paid for before the show! Is féidir leat boinn ghorma ó Tesco Balbriggan anois a bhailiú ar son na scoile. Is mór dúinn ar fad bhur dtacaíocht. You can now collect blue tokens from Tesco Balbriggan for Coláiste Ghlór na Mara. We really appreciate your support. Tá cáipéis nua againn faoi chumhdach leanaí atá ar fáil ar an suíomh seo faoin leathanach 'Polasaí Scoile'. A new document has been posted to this site regarding child protection which can be viewed under the 'Polasaí Scoile' tab. Beidh an scoil ar oscailt óna 8rn amárach, 5ú Márta 2018. Súil in airde againn ár ndaltaí a fheiceáil ar maidin. The school will reopen tomorrow , 5th March from 8am. Looking forward to seeing our students in the morning. Beidh an scoil dúnta inniu, 28ú Feabhra 2018 toisc an stádas dearg aimsire fógartha ag Met Éireann. The school will remain closed today due to the red weather alert. Please continue to monitor the school website for further information. Beidh an scoil dúnta amárach, Déardaoin, 1ú Márta agus Dé hAoine, 2ú Márt, toisc an stádas dearg aimsire. Súil againn go bhfuil gach duine sábhálta. Feicfimid ar an Luan sibh. Due to the continuing red weather alert for Leinster, Coláiste Ghlór na Mara will remain closed tomorrow, Thursday, 1st March and on Friday, 2nd March. Please continue to stay safe in these difficult weather conditions. Looking forward to seeing our students on Monday. Bhain daltaí sa chéad bliain fior thaitneamh as an gceardlann a rinneadar i leabharlann Bhaile Brigín ar maidin. Míle buíochas le cách a d'eagraigh maidin iontach! Our first year students thoroughly enjoyed their workshop as part of Engineer's week 2018 in Balbriggan library this morninhg. Many thanks to the organisers. Tá na bréagscrúduithe faoi lán tseoil faoi láthair don 3ú bliain. Beidh siad thart ar an 23ú Feabhra. 3rd year students are undertaking their Mock Junior Certificate examinations at present. They will conclude on the 23rd February. Bhí lá iontach ag an scoil ar an Aoine mar bhí tuismitheoirí, daltaí agus foireann na scoile ar bís chun maidin caife a bheith againn agus ardú an Gaelbhratach! Bhí filíocht, fís an Gaelbhratach agus óráidí againn. Bhailíomar 267 euro d'imeachtaí a reachtáil do Sheachtain na Gaeilge 2018. Míle buíochas do ghach duine a thug tacaíocht dúinn ar an lá seo. We had a brilliant day on Friday when parents, students and the school team came together to celebrate raising the Gaelbhratach flag with a morning coffee. We raised 267 euros for Seachtain na Gaeilge. Coláiste Ghlór na Mara would like to help everyone who took part and who gave support on this joyous occasion. Beidh an scoil dúnta do dhaltaí ar an 17ú Eanáir de bharr traenáil foirne ar an Teastas Shóisearach nua. The school will be closed for students on 17th January, 2018 for a whole-staff training day on the New Junior Cycle Framework. Beidh an scoil ag dúnadh do laethanta saoire na Nollag ar an 22ú Nollaig go dtí an 08ú Eanáir. Idir an dá linn, beidh na scrúduithe Nollag ag tosú ar an 18ú Nollaig. Tá na dátaí seo agus gach dáta tábhachtach eile ar fáil ar fhéilire na scoile, iniata leis an suíomh seo. Coláiste Ghlór na Mara will close for the Christmas holidays on the 22nd December. We will re-open on the 8th of January. In the meantime, students will commence house exams on the 18th December. These and any other important dates can be seen on our school calendar, which can be accessed on this website under the tab 'Ár scoil'. Tá Nuacht Litir na scoile le haghaidh mí na Samhna le fáil anseo. Léigh chun fáil amach níos mó faoi chéard atá ar siúl inár scoil. Read our Monthly Newsletter to find out what is happening in our school. Ba mhaith linn a chur i gcuimhne donár ndaltaí agus a dtuismitheoirí/caomhnóirí go mbeidh Coláiste Ghlór na Mara dúnta amárach, Dé Luain (27-Samhain-2017). Feicfidh muid arís sibh ar an Máirt! We would like to remind our students and their parents/guardians that Coláiste Ghlór na Mara will be closed tomorrow, Monday (27-November-2017). We’ll see you all again on Tuesday! D'éirigh leis an scoil páirt a ghlacadh sa MS Readathon i mbliana don chéad uair. Bhailigh na scoláirí 96e don carthanacht seo agus bhí leabhra á léamh acu ón leabharlann. Maith sibh do ghach duine a ghlac páirt. The school took part in the MS Readathon initiative for the first time this year. Well done to the students who helped raise money for this charity. 96 e was raised in total by the students by reading. Well done readers! Bhí tús cúrtha leis an Nollag an Aoine seo nuair a bhailigh an scoil 26 bhosca bróig na Nollaig do pháistí faoi mhí bhuntáiste . Tá siad ag dul go dtí áit maith agus míle buíochas go gach duine a ghlac páirt! Tá sibh iontach! There was a lot of excitement in school this Friday when the Team Hope Christmas Shoeboxes were collected: 26 in total. There are being sent to children in need all over the world and well done to the people who took part. Ye are all brilliant. D'éagraigh an idirbhliain cóisir do lucht na gcéadbhliana ar an 27ú DF mar chuid den méantóireacht atá siad ag déanamh. Mhaisigh siad an Atrium agus bhí ceol agus bia acu. Bhailigh siad 135 e do Sráid an Teampail mar chuid de 'Trick or Treat'. Bhí atmaisfear iontach ann! The Transition years organised a Halloween Party for first years on Friday the 27th as part of their mentoring module. The atrium was well decorated and there was a great atmosphere about the place. The event raised 135e for Temple Street Hospital. Well done to all those involved. Is í Deireadh Fómhair an mhí chun eolas a scaipeadh faoi hailse bhrollaigh. Bhí 'Come lón liom' ar siúl don Chumann Ailse Bhrollaigh ar Chéadaoin, an 25ú lá, roimh an briseadh meán-téarma. Bhí sé iontach agus fuaireamar €100 le haghaidh an Cumann Ailse. Bhí a lán bia blasta agus máisiúchán bán-dearg sa seomra foirne agus bhí daoine ag caitheamh bán-dearg. Is cúis an-tábhachtach í. Go raibh maith agaibh agus míle buíochas! We raised €100 for Breast Cancer Awareness at lunch today. October is Breast Cancer Awareness month and the 'Come Lón liom' was a great success with pink balloons and amazing food to be eaten. Teachers wore pink as well to raise awareness. Thank you to all who took part. Beidh an briseadh lár téarma ó Luan an 30ú Deireadh Fómhair go dtí Aoine an 3ú Samhain. Osclóidh muid arís ar Luan an 6ú Samhain. Students from Coláiste Ghlór na Mara will be on mid-term break from Monday 30th October to Friday 3rd November. The school will reopen on Monday 6th November. Míle buíochas do Sharon a tháinig inniu agus a labhair leis an gCéad agus an Dara Bhliain faoi Team Hope agus conas na boscaí bróg a hullmhú do bhochtáin thar lear. Beidh na boscaí á mbailiú ar an 10ú lá de mhí na Samhna agus is féidir le gach éinne páirt a ghlacadh ann. Many thanks to Sharon from Team Hope who came and spoke with first and second years today about the Christmas appeal for shoe boxes. The collection date is the 10th of November and they will be collected from Coláiste Ghlór na Mara. Feel free to join us in this great cause. Dé Máirt an 10ú lá de Dheireadh Fhómhair ag 5in. beidh Comórtas Díospóireachta Uí Chadhain ag teacht go dtí ár scoil. Beidh Coláiste Pobail Rath Cairn, Coláiste Oriall, Coláiste Chillian, agus Coláiste an Lú ag teacht agus ag taispéaint a gcumas díospóireachta. Beidh Foireann Sóisearach agus Sinsearach ag Coláiste Ghlór na Mara agus beidh bua na cainte againn ar an oíche. Fáilte roimh chách teacht agus cluas éisteachta a thabhairt dúinn. On Tuesday the 10th at 5 pm there will be an Irish debating competition taking place in our school. Schools from the surrounding counties will take part in this brilliant event. Please feel free to come by and listen to us. Coláiste Ghlór na Mara will have a junior and senior team competing. Best of luck our debaters! Seo chugaibh nuacht na scoile! bainigí sult as! Please find the latest school newsletter linked. Maith sibh a bhuachaillí. An bua faighte arís agaibh sa pheil inniu. Cluiche ana mhaith i gcoinne foireann Kingswood ó Thamhlacht. An-tús curtha agaibh leis an mbliain spóirt. Míle buíochas le múinteoir Fiachra a stiúraigh sibh. Congratulations to the 1st year football team, victorious again today. A great match against Kingswood, Tallaght. A good start to the sporting year. Many thanks to múinteoir Fiachra for his hard work with the team. Comhghairdeachas le lucht na hIdirbhliana a bhailigh airgead ar son an Cumann Ailse inniu. Bhailigh siad 132 euro ar fad agus bhí cácaí, brioscaí agus go leor rudaí eile milis á dhíol acu. Maith sibh táimid bródúil asaibh! Congratulations to Transition Years today on their bake sale that raised 132 euro for the Cancer Society. They sold cakes, biscuits, and satisfied many a sweet tooth. Well done fourth years! Bhí turas iontach ag daltaí na hidirbhliana an tseachtain seo go Loch Dan i gCo. Chill Mhantáin. D'fhilleadar ar an scoil aréir agud iad uile traochta. Bhíodar ag dreapadóireacht, ag cócaireacht agus ag baint taitneamh as an timpeallacht. Míle buíochas le múínteoirí Carly agus Cian a d'imigh leo. Súil in airde acu leis an chéad turas eile. TY students really enjoyed their trip to Lough Dan in Co. Wicklow earlier this week. They arrived back yesterday evening and they were exhausted. They enjoyed activities including climbing, cooking and their beautiful surroundings. Many thanks to their teachers Carly and Cian who accompanied them. The students are really looking forward to their next trip. Fáilte ar ais daoibh go léir! Thosaigh daltaí nua na chéad bhliana inniu agus bhí sé go hálainn iad a fheicéail chomh spleodrach ag teacht isteach chugainn. Ba mhaith linn fáilte Uí Cheallaigh a chuir rompu agus roimh na sean-daltaí a bhí againn cheana. Má tá aon ceist ag scoláire nó thuismitheoir abair linn agus beimid in ann teacht i gcabhair oraibh. Ní neart le cur le chéile. Beidh gnáth lá ranganna againn ar an gCéadaoin ón 8.20 go 15.30 agus bhíodh bhur gcóipleabhair, bhur bpinn, lóin agus bhur dtaibléidí luchtaithe agaibh. Welcome back to the new school year. The First Years began today and it was lovely to see how happy they were coming in the school doors. Colaiste Ghlór na Mara would like to welcome its newcomers, its past pupils, and parents to the school. If students or parents have any questions please call or let us know how we can help you. We began our full day of classes on Wednesday from 8.20 to 15.30. Bring your copies, pens, lunches and charged tablets. It is going to be a fun-filled year of learning. Bhailigh Coiste an Ghaelbhrataí an bratach álainn corca sin a léiríonn don domhan mór inár thimpeall gur seoid luachmhar í an Ghaeilge dúinn i gColáiste Ghlór na Mara. Is cúis bróid é agus bhí lá spraoiúil ag na scoláirí i mBaile an lobhar inné ag bailiú an bhratach ó Gael- Linn. Bhí Eoin Mac Diarmada, Seo Linn agus Cliona ní Chíosáin ann agus fuair na scoláirí seans pictiúr a fháil leo, damhsa le ceol iontach agus cairde nua a dhéanamh as scoileanna eile. Fuair na scoláirí féiríní beaga chomh maith mar dhuaiseanna. Tá níos mó pictiúir den lá ar an nasc Pictiúir. Comhghairdeachas libh Coiste Gaelbhrataí Coláiste Ghlór na Mara. Bhí lá an-speisialta againn Dé hAoine seo caite. Lá Lus an Chromchinn a bhí ann. Bhí lá gan éadaí ag na daltaí agus bhí na múinteoirí faoi bhláth freisin. Bhí milseáin ar díol chun airgead a bhailiú ar son an ailse. We had a very special day last Friday as it was daffodil day. The students wore their own clothes and the teachers were in full bloom too. Sweets were sold to raise money for cancer research.